They showed the following 10 photos to women who either self-identified as feminists or said that they were not feminists, and asked them to rate the pictures. Fig. 1. 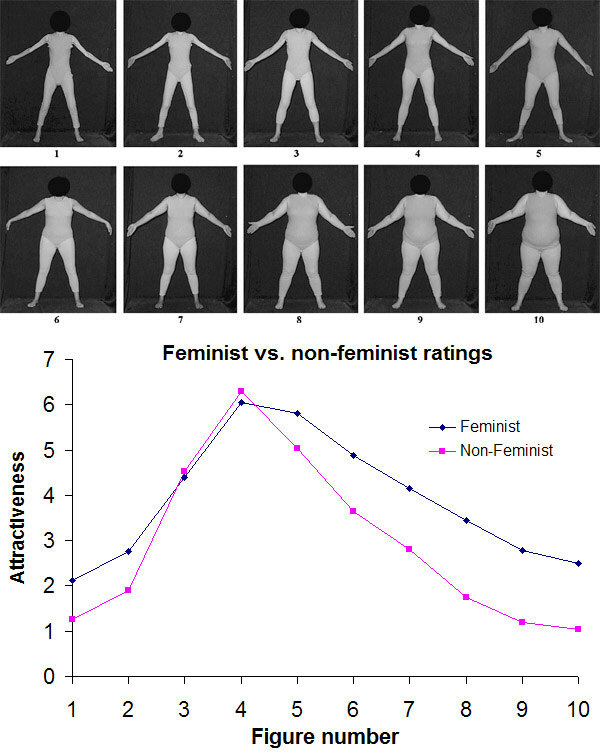 Ratings of women's bodies by feminist and non-feminist women. Feminists and non-feminists rated figures 3 and 4 similarly but differed for other figures. Note that both groups found figure 4 the most appealing. Feminists assigned higher attractiveness ratings to the skinny and, especially, overweight figures. So feminist women are apparently more accepting of body weight diversity, especially in the excess body fat range, but do not differ from non-feminists women in what they find optimally appealing. The authors cite some other studies that have similar finds. In general, women and men judge female attractiveness similarly. So one can safely extrapolate that feminist women’s optimal preferences regarding women are similar to those of the optimal preferences of heterosexual men. Feminist classification was based on self-identification. Whereas one could object to such simplistic classification, the feminist literature does a poor job of coming up with criteria that largely distinguish feminists from non-feminists. Hence, self-identification is a reasonable approximation. The photos do not depict feminine women. Figures 1-3 look like males. This affects ratings. I would rate figure 3 most appealing if it looked feminine, but because it doesn’t look like a woman, I find figure 4 most appealing. Curiously, the authors reported the body mass indices (BMI; weight in kilograms divided by the square of the height in meters) of the women used in the pictures as follows: figure 1 (12.51), figure 2 (14.72), figure 3 (16.65), figure 4 (18.24), figure 5 (20.33), figure 6 (23.09), etc. The WHO (World Health Organization) BMI cut off for low body fat from a health perspective is 18.5. So the optimally preferred physique was approximately underweight if one goes by the numbers, but figure 4 does not look underweight, and figure 6 is clearly overweight even though the numbers suggest that it is in the medically normal range. Similarly, going by the BMI, figure 3 would appear to trace the outline of the typical high-fashion model, but figure 3 is clearly fatter than the typical high-fashion model. The authors have messed up somewhere, and their conclusion about even feminists internalizing the thin fashion ideal does not follow. One need only look at figure 4 and ask oneself whether those that find it optimally appealing among the choices shown have internalized the thin fashion ideal (hint: this woman in nightmarishly obese for the typical fashion designer). In a similar previous study, using 50 women’s photos like those shown above, the authors reported an optimal preference for BMI in women on the part of women judges in the 19-20 range,(2) a little better range in light of the BMI cut off for good psychological health being about 20. (3, 4) If a study shows the average optimal BMI preference to be much lower in the general population with European ancestry, e.g., in the neighborhood of 18, something is not right with the data/imagery used. Swami, V., Salem, N., Furnham, A., and Tovee, M. J., The influence of feminist ascription on judgements of women's physical attractiveness, Body Image (2008), Epub, ahead of print, doi:10.1016/j.bodyim.2007.10.003. Swami, V., and Tovee, M. J., The influence of body weight on the physical attractiveness preferences of feminist and non-feminist heterosexual women and lesbians, Psychology of Women Quarterly, 30, 252 (2006).